Heriot’s coach Phil Smith is displaying the club’s strength in depth with nine changes for tomorrow’s Scottish Cup semi-final at home to Hawick. With only one of his first-team players unavailable, Smith has taken the opportunity to draw on the embarrassment of riches at his disposal. “The current strength of our squad is reflected in this week’s selection. Never before have I been able to make as many changes without feeling that I am weakening the team,” said Smith who has no drafted professionals available. The Goldenacre men were impressive winners over Currie Chieftains in last Saturday’s Tennent’s Premiership semi-final. And they are now looking to maintain their challenge for a league and cup double. Although Heriot’s won comfortably at Hawick earlier this month, Smith expects a tougher test tomorrow. 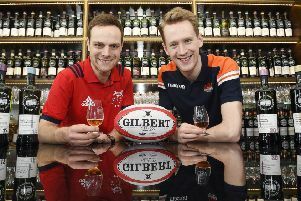 “Hawick will provide a different kind of animal this weekend as we pursue our goal of being in two finals,” added Smith. Smith has recalled Ali Johnstone, Adam Sinclair, Martin Hughes and Jason Hill to his pack, and has made five changes to his starting backs, with Rory McMichael and Jack Blain back in action after their involvement in the Under-20 Six Nations, while Craig Robertson, Rory Carmichael and Alex Ball also start. Smith, who is challenging all of his squad to stake a claim for places in next week’s play-off final, is also looking ahead to next season when he will work alongside the Super 6 coaches Ciaran Beattie and Finlay Gillies. “My main role will be with the amateur fifteen. It’s a sign that we are taking it really seriously – I want to keep building,” said Smith. Heriot’s will be looking for a repeat of the four-figure attendance that watched the triumph over Chieftains. The kick-off has been moved to 4pm to allow supporters to combine the tie with Edinburgh’s Heineken Champions Cup match at BT Murrayfield. And supporters attending both will benefit from reduced admission at Goldenacre when they produce their Edinburgh ticket. As was the case seven days earlier, the winners of the tie will meet either Melrose or Ayr. Ayr were the victors last week, but the Borderers have home advantage this time. 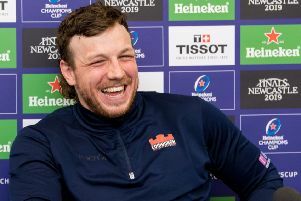 Hamish Watson reveals special diet for Edinburgh players: Spaghetti bolognese at 9.30am!